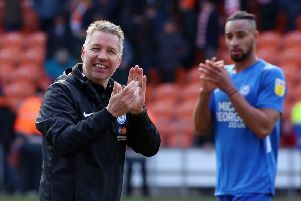 Peterborough United Manager Darren Ferguson celebrates the victory at Blackpool at full-time. Photo: Joe Dent/theposh.com. 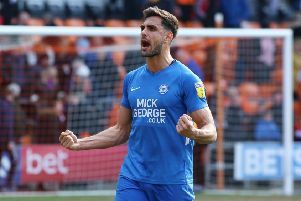 Both teams won today (April 13) with Posh beating Blackpool 1-0 at Bloomfield Road and Doncaster beating lowly Plymouth 2-0 at home. Marcus Maddison of Peterborough United celebrates the victory at Blackpool full-time. Photo: Joe Dent/theposh.com. Doncaster are still hot favourites to finish sixth as they have a five-point lead over Posh. Posh have a game in hand, but it is at automatic promotion chasers Portsmouth. Marcus Maddison’s goal sealed a third straight win for Posh which has followed a run of three straight defeats. Both Posh and Doncaster face promotion favourites Sunderland over Easter. “I’ve been in the position of chasing a team and I’ve managed a team that’s being chased,” Ferguson, who celebrated joyously in front of the 491 visiting fans after the game, said. “And I know the first thing Doncaster players would have asked after their game today is how Peterborough got on. They would have been disappointed when they found out. “Well we’re still in there fighting and it will interesting how Easter goes when everyone plays twice in quick succession. We will just try and win our games and see where it takes us. “I know there are many people not giving us much of a chance, but if we show the togetherness and team spirit that we showed today in the final five games we have a chance. “It was never going to be a classic on a poor pitch, but after a sloppy opening 15 minutes I felt we played the conditions really well. “It was a top team performance. I was delighted with every one of them including the substitutes. “Any win at Blackpool is a good one. You need to show a lot of character and mental strength and we did just that. The back four were excellent again and I say again that if we keep clean sheets we will win games because we have attacking quality. “And what a goal we scored today. The weight of Lee Tomlin’s pass and the finish from Marcus Maddison were top drawer. We had other opportunities to score and restricted them to very little. Marcus and Siriki Dembele put in great shifts on the wings as well as getting forward whenever possible. “I was disappointed Ivan Toney didn’t take his chance late on because he needs a goal for his confidence, but he was very good in general play. I went with his physicality ahead of Matt Godden on that pitch and it worked out well for us. Posh centre-back Ryan Tafazolli picked up a knee injury during the game. He will be assessed on Monday. Posh are next in League One action at Fleetwood on Good Friday (August 19, 3pm).